In one of the early chapters of The Love Project I had to reframe my relationship with rejection. When another guy I had been dating who seemed to be a very promising prospect went radio silence on me, I was quick to interpret his reaction as a personal failure. I certainly wasn’t on to a good start with The Love Project. But thankfully, I relayed my story and my self-blaming feelings to Dr. Carl Hindy (a clinical psychologist and relationship counsellor from New Hampshire, USA, and also my Subject Matter Expert during The Love Project) whose response lead me to explore the source of my default reaction to rejection. From a very early age, not having been told otherwise, I believed that ‘rejection’ was the result of something I did wrong or, ever worse, of my very own twisted and monstrous existence. It was no surprise that many years later, already into my thirties, I interpreted men’s rejection of me as a girlfriend like a personal failure. It didn’t matter whether they were suitable for me or not, the moment they rejected me, I was desperate to convince them to change their mind (which obviously only lead to more and more rejection). And with every so-called ‘failure’ I grew more and more disgusted with myself to the point that I began to rejected myself before I even went out on a new date. Without admitting it, I was ‘programmed’ for rejection because I didn’t believe in my own worth. It took a long time and a long string of dates that didn’t shape up into relationships until I began to love myself and give myself a chance. Fortunately, The Love Project had a wonderful happy ending. When I finally let go of my old beliefs and began to love and enjoy my life, I met the man I am now about to marry. Cured of the fear of rejection, at last! You would think. But the fear of rejection comes in many shapes and forms and life always has a way of feeding you just the right kind of circumstance to keep you facing and constantly changing your relationship with your fears. As you may know, I have now, two and a half years later, finished writing and editing The Love Project, the story of how I decided to take control of my love life by employing project management methods. The book as it stands today is a true labour of love, which I am very proud of. I am proud of the fact that I did what I did, went out there and found love and worked relentlessly on the book to make it as strong and as captivating as possible. But here’s the catch. I really wanted to avoid self-publishing The Love Project (I guess I just believe that traditional publishing is a testimony of quality and I want that sort of endorsement of value) and since December last year I sent out 24 agent submissions. 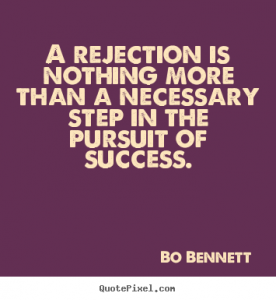 So far, I have received 12 rejections, while 10 agents did not get back to me at all (I’m just gonna go ahead and count those as rejections too). When I was in Sri Lanka volunteering at Millennium Elephant Foundation though, I had the most exhilarating of news: an agent wanted to read the entire manuscript. I sent it out mid-January and have been waiting for a feedback ever since. And the truth is it may not necessarily be an offer of representation. Taking Carl’s advice on board, I ‘stayed the course’ and eventually my fiancée and I found our way back to each other. This time too, I decided to ‘stay the course’. Because ‘rejection’ is always trying to teach me something. In the past it taught me that men have their own issues to deal with and sometimes going radio silence on a girl is just a default reaction to their own fear of being hurt.It has taught me that rejection is not a testimony of value, but a subjective matter that one shouldn’t even try to change or attempt to understand. This time, wiser, I choose to believe that the world wants to hear my story and if I have to resort to self-publishing, then so be it. I choose to reframe once again my relationship with rejection and I hope that The Love Project will find its way to its readers in the right way and at the right time.